Last Saturday, Paris’ Arc De Triomphe, an elegant monument and revered tourist attraction, was swarmed with thousands of raging protesters who torched luxury cars, set houses alight, mobilised stun grenades, raided shops, and confronted teargas firing riot police in one of the French capitals most affluent districts. This was the second week in a season of activism, or what the organisers of the movement coined, “Act 2”. Anti-Macron graffiti had been sprayed over the Arc De Triomphe. “The yellow vests will triumph” was scribed in a harsh bold black across the facade of the arc much to politicians dismay. 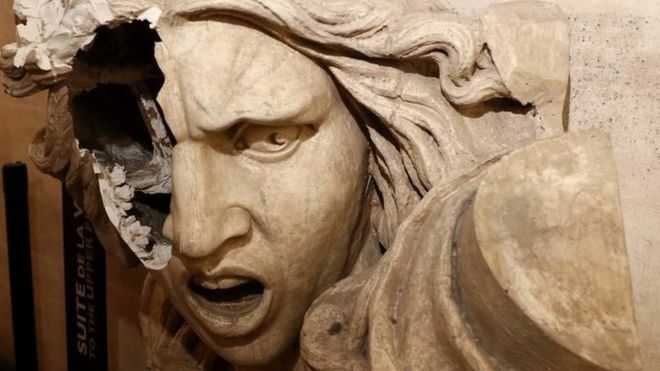 Protestors then streamed in to the monument, causing damage to its lower floors before making way for the roof. An assault rifle was reportedly stolen from a police vehicle, but it remains unclear as to whether it was loaded. The demonstrators have named themselves the “Gilets Jaunes”, effectively projecting a rather revolutionary zeal through their title. Directly translated as the, “Yellow Vests”, the demonstrations marked a staunch disdain for the newly proposed fuel tax, and formerly implemented policies. Diesel is the most commonly used fuel in French cars, and its cost has risen by 23% over the past 12 months. We now see it at its highest point since the early 2000s. In a world of falling oil prices, President Macron’s government had raised its hydrocarbon tax by 7.6 cents per litre on diesel, and 3.6 cents per litre on petrol this year, in light of their campaign for cleaner cars. Subsequently, the decision was made to impose a further 6.5 cents on diesel, and 2.9 cents on petrol on January 1st 29. This has clearly been the final straw for much of the French electorate. This sentiment has been embraced by the growing “Gilets Jeunes”. The fluorescent high visibility jacket wearing protesters, perhaps dressing synonymously with their desire to be seen and heard, has been active in displaying their infuriation at the taxes for over two weeks. They complained that President Macrons pro-business fuel tax policy was unfair to people in low-income employment. Macron has acknowledged the public outcry last week. He promised three months of national talks on how to transform France into a low carbon economy, without putting low-income families who are obliged to drive to work in vulnerable financial positions. However, government attempts to negotiate with the movement failed to work. By the early evening of last Saturday, the commotion had escalated, and luxury department stores on Boulevard Haussmann were evacuated as windows were smashed and fires were erected. The prestigious Louvre Museum and Tuileries Gardens experienced fire damage, and metal grilles were fervently ripped down. Across the 1st arrondissement’s Place Vendôme, multitudes of luxury jewellers and upmarket designer stores saw rioters smash walls and build makeshift barricades. Over 400 people have been arrested as a consequence. Amidst being at the forefront of Brexit affairs, and witness to Donald Tusks dismal comments on Theresa Mays. Brexit deal at the G20 summit this week, Macron said from Buenos Aires, Argentina that he will lead an emergency meeting of senior government ministers after returning to Paris on Sunday morning. “No cause justifies that security forces are attacked, shops pillaged, public or private buildings set on fire, pedestrians or journalists threatened, or that the Arc De Triomphe is sullied”, he affirmed. Macron told a source that he believes that the protesters have legitimate concerns and that he would hear their anger. The protests began somewhat peaceful in the early hours of last Saturday morning, with the ”Gilets Jaunes” assembling themselves by the Champs-Élysées for a march. About 5,000 protesters marched down the internationally renowned quartier, some carried roses, others opted for shouting “Macron, Resign!”. The faint sound of demonstrators singing Les Marseilles in unison ringed in the distance, evoking memories of the vigour of 1968 and even 1789. Security was quickly enforced, with bag checks taking place, and shop assistants boarding windows and dismantling terraces. Vehicle access was forbidden and shortly the area was sealed off by police control. This quickly escalated, resonating with the wider French populous, and awakened similar activism across the country. 75,000 “Gilets Jaunes” protested in cities, with officials stating that 106,000 protested across France last Saturday, consequently causing 580 roadblocks nationally, and even the brief storming of the Nantes Aeroport runway. Interior Minister Christophe Castaner said that thousands of troublemakers, not associated with the cause of the peaceful protesters had come to “pillage, smash and steal”. He called them “rioters who were professionals at causing disorder”, and concluded that police had cleared much of the rioters off the streets of central Paris by 8pm. Castaner boldly labelled the protests “an insult to the public”. Jacline Mouraud, a prominent activist within the movement, told BFM television that she finds it absurd that the “Yellow Vests” are projecting a definitive message that we either set France on fire, or find solutions. In contrast to this, another protester stated that, “the government is not listening. Revolution cannot happen without violence”.Jason Herbert, a spokesperson for the movement seconds this, “we want our dignity back”, he said, “we want to be able to live from our work, which is absolutely not the case today”. There seems to be plentiful confusion within the French government as to who to point fingers to or blame for the outbreak, whilst the world has been left with shocking imagery of a city coated in teargas and shrouded in fire. Macron believes that the last few weeks protests will damage France’s reputation both in the international community, and on a global platform. Now well into the third week of “Gilet Jeunes” protests, Macron is still insistent that his fuel policies are needed to combat global warming, but many believe that his centrist government is out of touch with the daily qualms of the general public who do not resonate with his political motives. The situation in France has initiated a copycat protest in Brussels, Belgium which occurred on Friday 30th November. An Italian protest group inspired by the “Gilet Jeunes” has garnered thousands of online supporters, but their focus is Italian independence from the European Union as opposed to domestic policy. Paris has begun a cleanup effort of the damage which reportedly costs up to £1.3 (€1.5) million, and the city has mobilised 200 extra workers in an attempt to get buildings back to their recognisable state. The “Gilets Jaunes” movement has sparked wider dissatisfaction with Macron and his government. We are yet to see whether this further unfolds or leaves the spotlight. Ministers have confidently stated that there will be no U-turn on fuel tax increases, whilst we see that protests in to fuel tax rises have grown into general anger at living costs.